Other Fantasy - RuneQuest 6 gets back to its roots. RuneQuest 6 gets back to its roots. Behold! 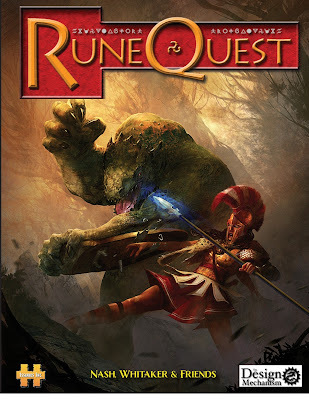 The latest official version of RuneQuest! Just been looking at the PDF - very comprehensive and complete. The printed version won’t be out until the end of the month but the PDF is on sale at DTRPG / RPGNow http://bit.ly/RQ6ed - Also it’s worth browsing older $1 products in the Design Mechanism store. This review might be a little premature, because I'm still at that excited-post-download phase when I'm feverishly clicking through the 458 pages. Four-hundred-and-fifty-eight pages of RuneQuest goodness. This definitely has the look and feel of an older RQ or BRP title. The mechanics and the writing style is very accessible, with the occasional black and white ink drawing. The rules, setting and atmosphere (with a bent towards ancient, mystical, classical) is generic enough to adapt to different campaigns, whilst providing enough detail for interesting springboard points especially regarding character (and monster) backgrounds, magic, skills, "passions" cults -not to mention the gritty effects of chaos. As well as the dice mechanics, there's plenty of tips and guidelines and optional rules. As I type it's still $25 which is a good price for a volume of this size. I'm looking forward to seeing a hard copy -surely it will be a thick tome - so the PDF on a tablet will certainly be more portable for fast rule checking at the table. Nice work, Design Mechanism! This is a respectable descendent of a noble line. Provide a comprehensive fantasy roleplaying game that capitalises on RuneQuest’s strengths. Re: RuneQuest 6 gets back to its roots.